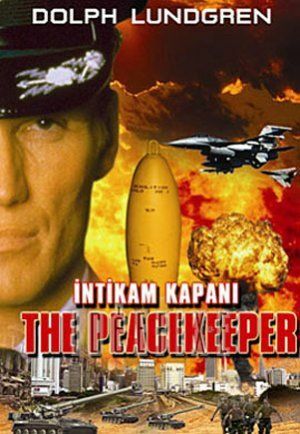 on paper, the peacekeeper seems like a good bet for a die hard-ish movie with dolph lundgren in a nuclear silo trying to prevent a national disaster. while that is more or less an apt description of the movie, the peacekeeper never really reaches that level. the end result is closer to fail safe and the rock than die hard. it hits all the notes during its performance but never quite seem know the song. the first act of the peacekeeper is definitely the best part of the movie. the opening credit sequence is not quite an i.o.a.s. (inconsequential opening action sequence, coined by me) nor a badass juxtaposition (coined by vern). the badass juxtaposition, in case you’re not familiar, is the soft spot of the badass action movie hero. an emotional or artistic side. a prime example would be chow yun fat playing jazz saxophone in hard-boiled, the origami in hard-boiled, the gun-in-one-hand-baby-on-the-other in hardboiled. other examples include leon the professional carrying and caring for the potted plant, johnny holiday being great at cooking in johnnie to’s vengeance, or clint eastwood playing the piano in in the line of fire. it’s a shorthand to make your badass action hero a well-rounded character instead of a musclehead fighting machine. dolph plays air force major frank cross (no relation to christopher or alex, as far as i know) dropping humanity aid (rice) on presumably a third world country. this charitable act is against the policy of his superiors. to avoid a court martial, cross is forced to work for u.s. president robert baker (the late roy scheider from jaws, jaws 2, sorcerer, marathon man, all that jazz, the french connection 52 pick-up, blue thunder), one of those guys with a suitcase handcuffed to his wrist and follows the president around. the suitcase, of course, contains the nuclear code for the president in case of a nuclear strike against the u.s.
the peacekeeper was released in 1997, so it was hard to imagine that an attack would occur on our native soil. even harder to think that we would attack another country, let alone a country in the general vicinity of the country that attacked us. but anyway, cross is asked to turn in his weapon once he gets to his new job, kinda like the give me your gun and your badge scene we all know and love. they are even smart enough to ask for his secondary weapon. this kind of raises expectations since knowing that it’s a die hard-ish movie, one is led to think that he is going to have to deal with the die hard-ish situation without guns. another misleading section in the first act is that they seem to be setting up the die hard situation in the hotel where cross meets the president. turns out they are only after the suitcase handcuffed to cross’ wrist. never trust decaf. the saving grace here is an amazingly done rooftop sequence. i’ve seen a lot of action and parkour movies involving rooftop chases, but this is the only one i can remember where it’s done entirely in cars, with grand theft auto-esque slowmo unique jumps. contradicting most die hard-ish movies, it gets worse once cross gets to the nuclear launch site where the majority of the movie takes place. after the first act, things grind to a halt and never recover. 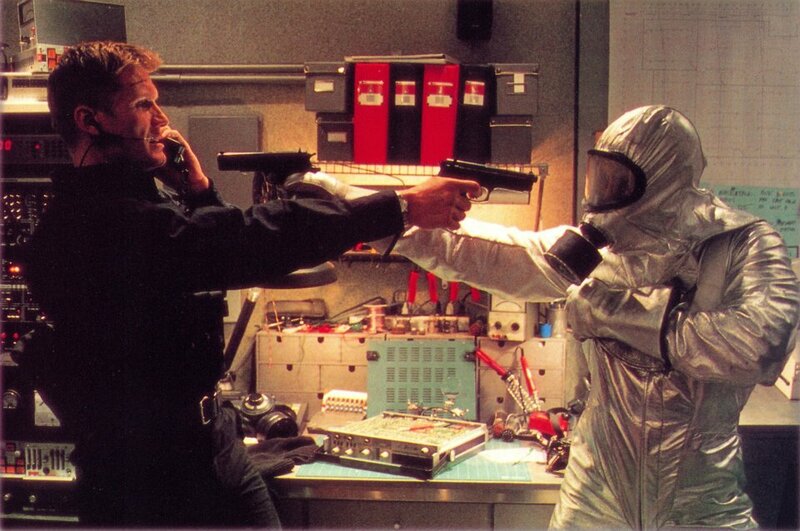 there is another fifteen minutes of setting up the bad guys taking over the nuclear facility. the charismatic, rebellious, and lively cross is now a two dimensional john mcclane ripoff. the closing nuclear facility is run by montel williams as lt. colonel northrop, who somehow manages to squeeze this in between hosting a daytime talk show and pitching blenders. 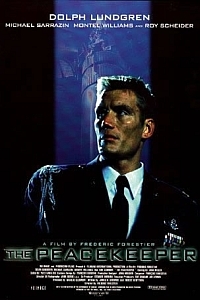 dolph lundgren later directed and starred in the defender, which has jerry springer as the president of the united states. please let me know if i missed any dolph/talk show host vehicles. maybe one where dolph has to rescue ricki lake as a terrorist hostage, or a mismatched buddy cop movie with dolph and ellen or anderson cooper. the lead villain lt. colonel douglas murphy, played by the late michael sarrazin (feardotcom, the arrival ii, gunball valley) didn’t get a chance to shine as villains in die hard-ish movies usually do. his motive is somewhat similar to ed harris in the rock, but with less authority and sympathy. in place of personality, they gave him a scar and one good eye. his i-am-serious-here’s-a-demo-of-how-evil-i-am scene has him detonating a nuclear missile on mt. rushmore, the causalities is mentioned but not seen. i am more worried about all those treasures that can be found based on this landmark from the national treasure movies. 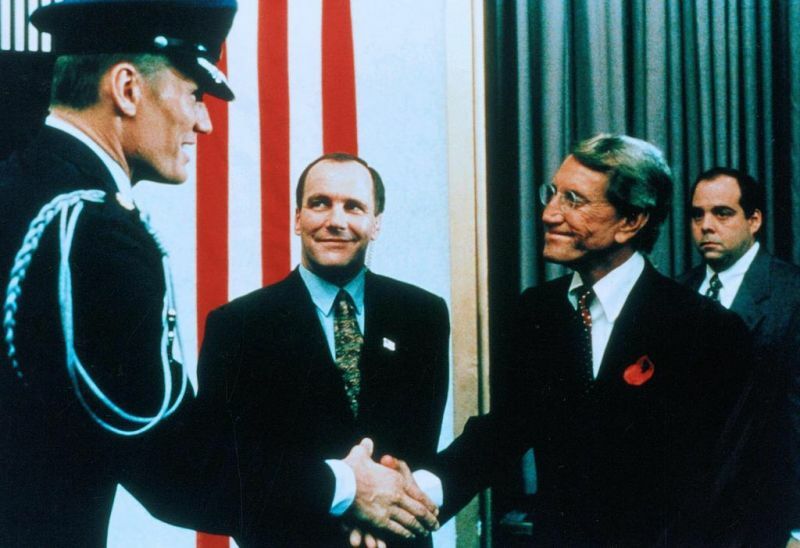 with northrop getting shot early on and murphy focusing on president baker, most of the movie involves dolph going into small rooms alternating between disposing terrorists and disarming nuclear missiles. it’s a shame that he uses guns rather than combats. there is a good movie to be made about these characters, die hard-ish or not. there have been good (die hard-ish) movies based on an authority figure who tries to do the right thing but lands on the wrong side because of politics or bureaucracy, such as the above mentioned in the line of fire, or BRUCE’s the last boy scout. of the die hard-ish element, and maybe it’s just personal preference, the nuclear missile silo setting is just not as appealing as say, a beautifully constructed skyscraper/building, an ocean liner/cruise ship, a mall, a rock concert, a hospital, a high tech house, a school, a ski resort, or a plane. at least no one in the movie pronounces the word as “nucular.” the good old days before that hick pronunciation was introduced. Great review! It was really funny to see Montel Williams as an action star….Maury Povich or Jenny Jones should have made action movies. he’s actually pretty good as the sidekick. i do wish they get to be in a better movie. probably better than jerry springer as the u.s. president.